A few years ago, popular band ‘OK GO’ released a new video that was set in front of an entire wall of printers that, throughout the video, printed out an array of colors in sync with the song. Though very visually pleasing, it left us here at Cash 4 Toners with one pressing question: “How many ink cartridges did they just waste? !” It may not seem like it was much, but we can almost guarantee these cartridges were not recycled – which means they’ll be sitting in a landfill somewhere for the next 1000 years. 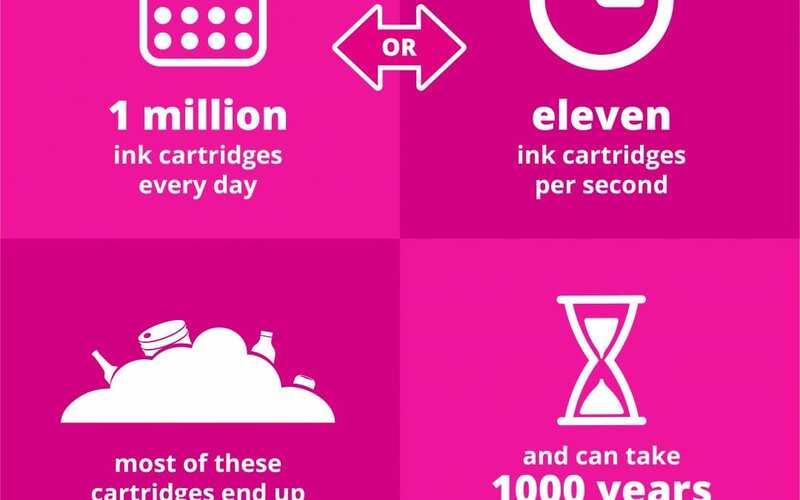 Check out the graphic below for some more staggering facts about non-recycled ink cartridges. In 2017, OK Go’s ‘Obsession’ video used a whole lot of printers (and paper) to display an impressive show of different colors behind the band. We know all of the paper was recycled, but what about the ink cartridges? According to our estimates, the band wasted close to 6,000 ink cartridges to make this video. Why does it matter? More than 365 million ink cartridges are thrown away every year. Have unused toner cartridges? Make some easy cash by selling your surplus toner to Cash 4 Toners today. Fill out an easy form, get fast and free shipping, and guaranteed highest payouts.